(4) To transact such other business as may properly come before the meeting or any adjournment or postponement thereof. These items of business are more fully described in the proxy statement accompanying this notice. The Board of Directors fixed the close of business on January 28, 2019 as the record date for the determination of the holders of our common stock and Exchangeable Shares entitled to notice of, and to vote at, the meeting. Accordingly, only stockholders of record on our books at the close of business on that date will be entitled to notice of and to vote at the meeting and any adjournment and postponement thereof. Stockholders are cordially invited to attend the Annual Meeting. If you wish to vote shares held in your name at the Annual Meeting, please bring your proxy card or voting instruction form (for holders of Exchangeable Shares), and picture identification to the meeting. Please note that Bionik shares may only be voted by the record owner of the shares, so the holders of Bionik shares held in the name of an intermediary and who wish to vote those shares in person at the meeting must obtain a valid proxy from the intermediary in order to vote the shares in person at the meeting. Your vote is extremely important. We appreciate you taking the time to vote promptly. After reading the proxy statement, please vote, at your earliest convenience, by completing, signing and returning your proxy card or voting instruction form (for holders of Exchangeable Shares) by mail. If you decide to attend the Annual Meeting and would prefer to vote by ballot, your proxy or voting instructions, as the case may be, will be revoked automatically and only your vote at the Annual Meeting will be counted. YOUR SHARES CANNOT BE VOTED UNLESS YOU VOTE BY: (i) A PAPER PROXY CARD, COMPLETED, SIGNED AND RETURNED BY MAIL, OR BY INTERNET, IF YOU ARE A HOLDER OF OUR COMMON STOCK, (ii) A PAPER VOTING INSTRUCTION FORM PROVIDED TO THE TRUSTEE OF OUR SPECIAL VOTING PREFERRED STOCK, COMPLETED, SIGNED AND RETURNED BY MAIL TO THE TRUSTEE, IF YOU ARE A HOLDER OF OUR EXCHANGEABLE SHARES, OR (iii) ATTENDING THE ANNUAL MEETING AND VOTING IN PERSON. This proxy statement is furnished in connection with the solicitation of proxies by the Board of Directors (the “Board”) of Bionik Laboratories Corp. (“we,” “our,” “us,” “Bionik” or the “Company”), to be voted at the annual meeting of stockholders (the “Annual Meeting”) to be held at the offices of the Company at 483 Bay Street, N105, Toronto, Ontario, Canada M5G 2C9 on March 18, 2019 at 10:00 a.m., Eastern Time, or at any adjournment or postponement of the meeting. This proxy statement and form of proxy will first be sent to stockholders on or about February 13, 2019. The cost of the Annual Meeting, including the cost of preparing and delivering this proxy statement and proxy, will be borne by us. We may use the services of our directors, officers, employees and contractors to solicit proxies, personally or by telephone, but at no additional salary or compensation. We will also request banks, brokers and others who hold our voting securities in nominee names to distribute proxy soliciting materials to beneficial owners and will reimburse such nominees for reasonable out-of-pocket expenses which they may incur in so doing. The holders of record of our common stock, $0.001 par value per share (“Common Stock”), and the holder of the sole share of the Special Voting Preferred Stock, $0.001 par value per share (the “Special Voting Preferred Stock”), as of January 28, 2019 are entitled to notice of and to vote at the Annual Meeting. The holder of the Special Voting Preferred Stock holds the share as trustee for the holders of exchangeable shares (“Exchangeable Shares”) of our indirect subsidiary Bionik Laboratories Inc. (“Bionik Canada”) as set forth in the Voting and Exchange Trust Agreement among the Company, Bionik Canada and Computershare Trust Company of Canada (the “Trustee”), dated February 26, 2015 (the “Trust Agreement”). The Exchangeable Shares were issued in connection with the acquisition by us of Bionik Canada on February 26, 2015. The Exchangeable Shares have substantially the same economic and voting rights as our Common Stock, and holders are entitled to instruct the Trustee as to how to vote their Exchangeable Shares or they may attend the Annual Meeting and exercise their vote personally. Each share of Common Stock is entitled to one vote. The one share of Special Voting Preferred Stock is entitled to an aggregate number of votes equal to the number of Exchangeable Shares issued and outstanding as of the record date. However, the Trustee will exercise each vote attached to the Special Voting Preferred Stock only on the basis of instructions received from the holders of record of the Exchangeable Shares. In the absence of instructions from a holder as to voting, the Trustee will not exercise any voting rights with respect to the Exchangeable Shares held by such holder. The holders of the Common Stock and the holder of the Special Voting Preferred Stock vote together as a single class. · By Mail – You may vote your shares by signing and returning the enclosed proxy card. If you vote by proxy card, your “proxy” (each or any of the individuals named on the proxy card) will vote your shares as you instruct on the proxy card. If you sign and return the proxy card, but do not give instructions on how to vote your shares, your shares will be voted as recommended by the Board, as described below. · By Internet – You may vote your shares by Internet by going to www.vstocktransfer.com/proxy. Follow the instructions included in the proxy card to vote by internet. · In Person – You may attend the Annual Meeting and vote in person. We will give you a ballot when you arrive. If your stock is held in the name of your broker, bank or another nominee (a “Nominee”), you must present a proxy from that Nominee in order to verify that the Nominee has not voted your shares on your behalf. If your shares are held in “street name” (held in the name of a bank, broker or other holder of record), you will receive instructions from the holder of record. You must follow the instructions of the holder of record in order for your shares to be voted. Internet voting also will be offered to stockholders owning shares through certain banks and brokers. If your shares are not registered in your own name and you plan to vote your shares in person at the Annual Meeting, you should contact your broker or agent to obtain a legal proxy or broker’s proxy card and bring it to the Annual Meeting in order to vote. · By Mail – You may vote by signing and returning the enclosed voting instruction form to the Trustee. This form permits you to instruct the Trustee to vote at the Annual Meeting through its share of the Special Voting Preferred Stock. The Trustee must receive your voting instruction by 5:00 p.m. (Toronto Time) on March 17, 2019, at the address indicated on the voting instruction form or for an adjourned meeting not less than 48 hours before the time set for the holding of the adjourned meeting. This will give the Trustee time to tabulate the voting instructions and vote on your behalf. · In Person – If you wish to attend the meeting and vote in person rather than have the Trustee exercise voting rights on your behalf, you may instruct the Trustee (by following the procedures set forth in the enclosed voting instruction form) to give you or your designee a proxy to exercise the voting rights personally at the Annual Meeting. You may also instruct the Trustee to give a proxy to a designated representative of Bionik to exercise such voting rights. Only holders of Exchangeable Shares whose names appear on the records of Bionik as the registered holders of Exchangeable Shares on the Record Date are entitled to instruct the Trustee as to how to exercise voting rights in respect of their Exchangeable Shares at the Annual Meeting. If on the Record Date your Exchangeable Shares were held, not in your name, but rather in the name of a Nominee, then you are the beneficial owner of shares held in “street name” and these proxy materials, if you have received them, are being forwarded to you by that Nominee. The Nominee holding your account is considered to be the stockholder of record for purposes of instructing the Trustee as to how to vote your Exchangeable Shares. As a beneficial owner, you have the right to direct your Nominee on how to instruct the Trustee to vote your Exchangeable Shares. On January 28, 2019, there were a total of 2,337,964 shares of Common Stock and 273,574 Exchangeable Shares outstanding. The presence in person or by proxy of a majority of the outstanding shares of Common Stock and Exchangeable Shares entitled to vote at the meeting will constitute a quorum for the transaction of business at the Annual Meeting. · In accordance with the judgment of the persons named as proxies in the form of proxy on such other business or matters which may properly come before the Annual Meeting. Other than the matters set forth in the Notice of Annual Meeting accompanying this proxy statement, we know of no matters to be brought before the Annual Meeting. Brokers and other nominees who hold Common Stock in “street name” and do not receive instructions from their clients on how to vote on a particular proposal are permitted to vote on routine proposals but not on non-routine proposals. The absence of votes from brokers on non-routine proposals are referred to as broker non-votes. Proposals such as the ratification of the independent registered public accounting firm are considered routine. The election of directors and the proposal regarding the compensation of our named executive officers are non-routine. Thus, if stockholders do not give their broker or nominee specific instructions, their shares may not be voted for the election of directors or the proposal regarding compensation. Abstentions and broker non-votes will be counted as present for purposes of establishing a quorum. · Directors are elected by a plurality of votes cast at the Annual Meeting (assuming a quorum is present). Consequently, any shares not voted at the Annual Meeting, whether due to abstentions, broker non-votes or otherwise, will have no impact on the election of directors. · The advisory vote on the compensation of our named executive officers as described in this proxy statement (“Say-on-Pay”) will be approved if it receives the affirmative vote of a majority of the voting power of the shares present in person or represented by proxy at the Annual Meeting and entitled to vote. An abstention will count as a vote “against” this proposal. Broker non-votes will have no effect on this proposal as brokers are not entitled to vote on such proposals in the absence of voting instructions from the beneficial owner. · The ratification of the appointment of our independent registered public accountant will be approved if it receives the affirmative vote of a majority of the voting power of the shares present in person or represented by proxy at the Annual Meeting and entitled to vote. An abstention will count as votes “against” this proposal. The ratification of the appointment of our independent registered public accountant is a routine proposal on which a broker or other nominee is generally empowered to vote in the absence of voting instructions from the beneficial owner, so broker non-votes are unlikely to result from this proposal. If you are a holder of Common Stock, you may revoke your proxy at any time before the proxy is voted at the Annual Meeting. This can be done by either submitting another properly completed proxy (either card or through the internet) with a later date, sending a written notice of revocation to the Company with a later date or by attending the Annual Meeting and voting in person. You should be aware that simply attending the Annual Meeting will not automatically revoke your previously submitted proxy; rather you must notify a Company representative at the Annual Meeting of your desire to revoke your proxy and vote in person. Written notice revoking a proxy should be sent to the tabulation agent or to Leslie Markow, Chief Financial Officer, at 483 Bay Street, N105, Toronto, Ontario Canada M5G 2C9. If you are a holder of Exchangeable Shares, you have the right to revoke any instructions previously given to the Trustee by giving written notice of revocation of such instructions to the Trustee or by executing and delivering to the Trustee a later-dated voting instruction by 5:00 p.m., Eastern time on March 17, 2019, at the address indicated on the voting instruction form or for an adjourned meeting not less than 48 hours before the time set for the holding of the adjourned meeting. YOUR VOTE IS IMPORTANT. PLEASE RETURN THE PROXY BY MAIL PROMPTLY SO YOUR SHARES CAN BE REPRESENTED, EVEN IF YOU PLAN TO ATTEND THE MEETING IN PERSON. The Board currently consists of seven members, with one vacancy on the Board. All of such members have been nominated to serve until the next annual meeting of stockholders and until their successors are duly elected and qualified. The eight nominees listed below have indicated that they are willing and able to serve as directors. If any of the nominees becomes unable or unwilling to serve, the accompanying proxy may be voted for the election of such other person as shall be designated by the Board. Andre Auberton-Herve: Chairman of the Board. Mr. Auberton-Herve has been the Chairman of the Company’s Board of Directors since January 24, 2018. Mr. Auberton-Herve brings substantial leadership experience within strategic, operational, and financial activities from past roles. Mr. Auberton-Herve is the founder of 4A Consulting & Engineering, which provides strategic advice and consulting services with respect to renewable energy and digital innovation, and has served as its President and CEO since its founding in July 2015. 4A Consulting provided consulting services to the Company from February 2017 until Mr. Auberton-Herve’s appointment as Chairman. Mr. Auberton-Herve co-founded Soitec SA, a publicly traded company on the Euronext Paris stock exchange which designs and manufactures innovative semiconductor materials which are used in many smartphone platforms and computing activities, where he was President and CEO from July 1992 until January 2015, then Chairman and Chairman Emeritus since September 2015. While at Soitec SA, Mr. Auberton-Herve was responsible for overseeing the strategic, operational and financial activities of the company. He built an international high-tech group in ten countries and five manufacturing facilities in Europe, Asia and the U.S. Mr. Auberton-Herve also led the company through its listing on Euronext in 1999, raising significant amounts of capital since then with some of the world’s largest investment banks. He has been nominated Knight of the Legion of Honor and Knight of the Order of Merit in France. Mr. Auberton-Herve holds a Doctorate degree in Semiconductor Physics and a Master’s degree in Materials Science from Ecole Centrale de Lyon in France. The Company believes that Mr. Auberton-Herve is qualified as a Board member of the Company because of his substantial strategic, operational and leadership experience. Dr. Eric Dusseux: Chief Executive Officer and Director. Dr. Dusseux has served as the Company’s Chief Executive Officer since September 1, 2017 and has served as a director since July 22, 2017. He was previously the President Europe at Auregen BioTherapeutics SA and was a director at Auregen BioTherapeutics Inc., which is translating 3D bioprinting technology for innovative treatments for patients with rare disorders, since February 2017. Prior to that, from November 2016 through January 2017, Dr. Dusseux was President Europe at Bemido SA, a family office. From September 2012 to October 2016, Dr. Dusseux was an Executive Committee Member in the Corporate Strategy Department of Sanofi Pasteur SA, the vaccines division of Sanofi, a global healthcare leader, where he led corporate strategy, business intelligence, and international business development. He has also served in key roles at GlaxoSmithKline Biologicals from January 2008 to June 2012, leading product development and business growth strategy. Dr. Dusseux also gained significant experience providing strategic advice for numerous pharmaceutical, medical device, payer and biotechnology clients, while working for the Boston Consulting Group from 2002 to 2007. Dr. Dusseux is a Medical Doctor, specializing in Public Health. Dr. Dusseux also holds a Master of Science in Physical Chemistry and is a graduate of the French Business School H.E.C. in Paris (MBA, Isa). We believe that Dr. Dusseux is qualified as a Board member of the Company because of his substantial strategic and leadership experience within the healthcare industry. P. Gerald Malone: Director. Mr. Malone has been a director of the Company since March 19, 2018. Since 1997, Mr. Malone has held a number of directorships and chairmanships in private and AIM listed companies in the healthcare, IT and energy sectors in the UK and the USA. He has extensive experience within the financial services sector, serving since 2001 as a board member and ultimately Chairman of Aberdeen Asia-Pacific Income Fund (FAX), a U.S. closed-end mutual fund. He also serves as a director of a number of other U.S. and Canadian closed- and open-end mutual funds, and of the Washington, D.C.-based Mutual Fund Directors Forum, a body representing independent fund directors. A Scottish lawyer by profession, Mr. Malone was previously a Member of Parliament in the U.K. from 1983 to 1997, and served as Minister of State for Health in John Major’s government from 1994 to 1997. Mr. Malone is qualified as a Board member of the Company because of his substantial commercial strategic, government and leadership experience. Joseph Martin: Director. Mr. Martin currently serves as Chairman of Brooks Automation, a global provider of automation, vacuum and instrumentation solutions. He also serves as a director of Collectors Universe, Inc., a third party grading and authentication service for high-value collectibles, of Allegro Microsystems, a manufacturer of high-performance semiconductors for the automotive market, Fairchild Semiconductor, ChipPAC Inc. and Soitec Inc. In 2000 CFO Magazine awarded Mr. Martin the CFO of the Year award for turnaround operations. Mr. Martin holds an Executive Masters certification from The American College of Corporate Directors. We believe Mr. Martin is qualified to serve as a member of the Board of Directors due to his extensive board and financial expertise. Charles Matine: Director. Mr. Matine serves as an Advisory Board Member of Enlaps, a start-up company providing a time-lapse solution to photographers, since February 2018. Since July 2015, Mr. Matine has served as a strategic advisor to C4 Ventures, a London-based venture fund supporting media, e-commerce and hardware startups. In April 2014, Mr. Matine founded B & Associates, a marketing and digital transformation consultancy firm, and has served as its CEO since April 2014. Prior to that, Mr. Matine served as a Business Unit Director of Apple France from July 2010 to April 2014, where he led the Education and Research business unit, and as a Senior Marketing Manager of Apple Europe from April 2006 to June 2010, where he was responsible for promoting Apple products and defining marketing, PR and branding strategies within central Europe, the Middle East and Africa. Prior to Apple, Mr. Matine worked extensively in marketing and advertising, promoting technology products and brands throughout Europe. Mr. Matine studied at Sciences Po (the Paris Institute for Political Studies, Section Public Service) and holds the IFA-Sciences Po non-executive director certificate. We believe that Mr. Matine is qualified as to serve as a member of the Board of Directors because of his experience with product marketing and go-to-market strategies. Audrey Thevenon, Ph.D.: Director. Dr. Thevenon serves as a Program Officer on the Board of Life Sciences at the National Academies of Sciences, Engineering and Medicine (“NASEM”), a private, nonprofit institution that provides high-quality, objective advice on science, engineering, and health matters, since October 2016, and previously served as the Associate Program Officer of NASEM from August 2014 to October 2016. Dr. Thevenon also serves as the Managing Editor of the journal Institute for Laboratory Animal Research at NASEM. From February 2012 to July 2014, Dr. Thevenon was a Postdoctoral Fellow at the Uniformed Services University of the Health Sciences in Bethesda, MA. Dr. Thevenon has also completed a Postdoctoral Fellowship at the University of Hawaii in placental pharmacology. Dr. Thevenon has a Ph.D. and an MS both in Biology from Georgetown University, as well as an MS in Cell Biology & Physiology and a BS in Life Sciences and Environment from the University of Rennes 1 in France. We believe that Dr. Thevenon is qualified as to serve as a member of the Board of Directors because of her experience in medicine and scientific innovation. Michal Prywata: Chief Technology Officer. Mr. Prywata is the co-founder of Bionik Canada and has served as our Chief Technology Officer since June 2017, and Chief Operating Officer from April 2013 to June 2017. Mr. Prywata previously served as a director from March 2011 until September 2018. Mr. Prywata previously served as our Chief Executive Officer from March 2011 to April 2013. Mr. Prywata studied biomedical engineering at Ryerson University until the end of his second year, with a focus on electronics and software development for medical products. He has a track record of winning technology showcases and inventing technologies that address significant unmet needs and untapped markets. He has spent the past 6 years with Bionik Canada, managing technological advancements, managing day-to-day operations, and developing concepts into products. In addition, Mr. Prywata, together with his co-founder, was responsible for raising and securing initial seed capital and subsequent capital raises. Mr. Prywata is the co-inventor of the Company’s ARKE technology platform. We believe Mr. Prywata is qualified to serve as a member of the Board of Directors due to his being a founder of the Company and his current executive position with the Company. We also believe that Mr. Prywata is qualified due to his experience in the medical device industry. There are no family relationships among any of our current or proposed officers and directors. Our officers serve at the pleasure of the Board. If a quorum is present at the meeting, directors are elected by a plurality of votes cast at the Annual Meeting. Stockholders do not have cumulative voting rights in the election of directors. You may vote for all of the nominees as directors or withhold your vote from any or all of the nominees as directors. The Board of Directors recommends a vote FOR all the director nominees listed above. Leslie Markow: Chief Financial Officer. Ms. Markow has served as the Company’s Chief Financial Officer since September 2014. She is a CPA CA in Canada, a US CPA (Illinois) and Chartered Director. From 2002 to 2004 and since 2010, Ms. Markow has provided outsourced CFO, controller and financial services on a part-time basis to numerous public and private companies. In addition, in 2012-2013, Ms. Markow was the Chief Financial Officer of Stewardship Ontario, a supply chain operator of Blue Box and Orange Drop Programs for industry in the Province of Ontario. In 2010-2012, Ms. Markow was the Chief Financial Officer of Blue Ocean NutraSciences Inc. (formerly Solutions4CO2 Inc.), a public CO2 solution industrial company. From 2004 to 2010, Ms. Markow was the Director of Client Service for Resources Global Professionals, a NASDAQ-listed global consulting firm. From 1991-2002, she held various positions at SunOpta Inc. a TSX-NASDAQ listed company, which at that time was named Stake Technology Ltd. and was an industrial technology manufacturer, including as Chief Administrative Officer, Vice-President Regulatory Reporting & Compliance, Chief Financial Officer and Vice-President–Finance and Controller. Ms. Markow started her career in 1983 with predecessors of PricewaterhouseCoopers, ultimately holding a position as Senior Audit Manager and in 1991, she moved to SunOpta Inc. Ms. Markow is a member of the Board of Directors and Chairperson of the Audit Committee of Jemtec Inc., a Canadian public company that sells monitoring hardware and software. She also is a member of Financial Executives Canada, where she is a past National Board Director, Toronto Board Director, Toronto Chapter President and the winner of the Toronto Leadership Award, and is a faculty member of The Directors College, which is a joint venture of McMaster University and The Conference Board of Canada. Renaud Maloberti: Chief Commercial Officer. Mr. Maloberti has served as the Company’s Chief Commercial Officer since June 11, 2018. From April 2012 through May 2018, Mr. Maloberti held various positions at FujiFilm SonoSite Inc., which develops cutting-edge, portable and point-of-care ultrasound solutions, most recently as Vice President and General Manager of the SonoSite High Frequency Division, where as he led the development and launch of the world’s first and only ultra-high frequency ultrasound and led the division through double-digit revenue growth for six years. Mr. Maloberti previously served as General Manager, Americas for BK Medical Systems, a subsidiary of Analogic Corporation (Nasdaq:ALOG), a leader for advanced imaging technologies and real-time guidance systems in disease diagnosis and treatment, from November 2006 through March 2012. Prior to that, from October 2004 through October 2006, he was the Director of Marketing and Product Management at Draeger Medical Systems for its patient monitoring and healthcare IT business. From July 1994 through October 2004, Mr. Maloberti held various positions with GE Healthcare and GE Medical Systems, most recently as Manager, Global Radiography Business. Mr. Maloberti holds an MBA in global marketing from the F.W. Olin Graduate School of Business at Babson College, and a Bachelor’s Degree in International Finance from ESLSCA Business School in Paris, France. Our Board maintains a policy of reviewing and considering communications from our stockholders and other interested parties. Any interested party who desires to contact the Board may do so by fax, telephone, or regular mail addressed to the Board of Directors, c/o Leslie Markow, Chief Financial Officer, 483 Bay Street, N105, Toronto, Ontario, Canada M5G 2C9; telephone: (416) 640-7887 x108, email: lm@bioniklabs.com. Such communications can be sent to the Board by mail in a sealed envelope addressed to an individual director, the non-management directors or the full Board. The Corporate Secretary will deliver the envelope unopened (1) if addressed to a director, to the director, (2) if addressed to the Board, to the Chairman of the Board who will report thereon to the Board, or (3) if addressed to the non-management directors, to the non-management directors. Stockholders can also send electronic communications to the Board via e-mail to Leslie Markow, our Chief Financial Officer, who will forward the communication to the intended recipient. Our directors periodically review communications from stockholders and other interested parties and determine, in their discretion, whether the communication addresses a matter that is appropriate for consideration by the Board. While we do not have a formal policy regarding attendance of annual meetings, directors are encouraged to attend the annual meeting of stockholders and receive communications directly from stockholders at that time. At our last annual meeting, all of our directors who were directors at that time attended in person or by teleconference. The business and affairs of the Company are managed under the direction of our Board which as of February 11, 2019 is comprised of Messrs. Auberton-Herve, Dusseux, Gaston-Dreyfus, Martin, Malone, Matine and Dr. Thevenon. There have been no changes in any state law or other procedures by which security holders may recommend nominees to our Board. Presently, the Board has two standing committees — the Audit Committee and the Compensation Committee. All members of the Audit Committee and the Compensation Committee are, and are required by the charters of the respective committees to be, independent as determined under Nasdaq Listing rules. On May 30, 2018, our Board formed an Audit Committee, of whom Messrs. Martin (Chairman), Malone and Matine are the members. Each of the members of the Audit Committee is independent, and the Board has determined that Messrs. Martin and Malone are each an “audit committee financial expert,” as defined in SEC rules. The Audit Committee acts pursuant to a written charter which is available through our website at www.bioniklabs.com. The primary functions of the Audit Committee are to assist the Board in overseeing (i) the effectiveness of the Company’s accounting and financial reporting processes and internal controls and the audits of the Company’s financial statements, (ii) the qualifications, independence, appointment, retention, compensation and performance of the Company’s registered public accounting firm and (iii) the performance of the Company’s internal audit department or department or person(s) having the equivalent responsibility and functions. On May 30, 2018, our Board formed a Compensation Committee, of whom Messrs. Malone (Chairman) and Martin and Dr. Thevenon are the members. Each of the members of the Compensation Committee is independent. The Compensation Committee acts pursuant to a written charter which is available through our website at www.bioniklabs.com. The primary functions of the Compensation Committee are to (i) review and approve corporate goals and objectives relevant to executive compensation, (ii) determine and review the CEO’s and other executive officers’ compensation, and (iii) make recommendations to the Board concerning (a) compensation and (b) adoption of equity incentive plans. Companies face a variety of risks, including financial reporting, legal, credit, liquidity, and operational risk. The Board believes an effective risk management system will (1) timely identify the material risks that the Company faces, (2) communicate necessary information with respect to material risks to senior executives and, as appropriate, to the Board or relevant Board Committee (if any), (3) implement appropriate and responsive risk management strategies consistent with Company’s risk profile, and (4) integrate risk management into Company decision-making. The Board as a whole oversees risk management after receiving briefings provided by management and advisors as well as its own analysis and conclusions regarding the adequacy of the Company’s risk management processes. During the fiscal year ended March 31, 2018, our Board met 11 times. No director who served as such in the fiscal year ended March 31, 2018 attended less than 75% of the meetings held during such period. Our Board has no nominating committee. The Board has determined that director nominees could be selected, or recommended for our Board's selection, by the independent members of the Board. The Board does not currently have a charter or written policy with regard to the nomination process. The nominations of the directors standing for election at the Annual Meeting for the fiscal year ended March 31, 2019 were recommended and approved by our independent directors. At this time, we do not have a formal policy with regard to the consideration of any director nominees recommended by our stockholders because historically we have not received recommendations from our stockholders and the costs of establishing and maintaining procedures for the consideration of stockholder nominations would be unduly burdensome. However, any recommendations received from stockholders will be evaluated in the same manner that potential nominees recommended by Board members, management or other parties are evaluated. Any stockholder nominations proposed for consideration should include the nominee's name and qualifications for Board membership and should be addressed to: Leslie Markow, Chief Financial Officer, Bionik Laboratories Corp., 483 Bay Street, N105, Toronto, Ontario, Canada M5G 2C9. We do not intend to treat stockholder recommendations in any manner different from other recommendations. Qualifications for consideration as a director nominee may vary according to the particular areas of expertise being sought as a complement to the existing Board composition. However, in making its nominations, our Board as a whole considers, among other things, an individual's business experience, industry experience, financial background, breadth of knowledge about issues affecting our company, time available for meetings and consultation regarding company matters and other particular skills and experience possessed by the individual. We do not currently employ an executive search firm, or pay a fee to any other third party, to locate qualified candidates for director positions. We adopted a Code of Business Conduct and Ethics that applies to, among other persons, our principal executive officers, principal financial officer, principal accounting officer or controller, and persons performing similar functions. Our Code of Business Conduct and Ethics is available on our website www.bioniklabs.com. Under such definitions, Messrs. Martin, Malone, Matine, Gaston-Dreyfus and Dr. Thevenon are considered independent directors. The Board has reviewed and discussed the audited consolidated financial statements of Bionik Laboratories Corp. for the fiscal year ended March 31, 2018, with management and have reviewed related written disclosures of MNP LLP, our independent accountants of the matters required to be discussed by SAS 114 (Codification of Statements on Auditing Standards, AU Section 380), as amended, with respect to those statements. We have reviewed the written disclosures and the letter from MNP LLP required by regulatory and professional standards and have discussed with MNP LLP its independence in connection with its audit of our most recent financial statements. Based on this review and these discussions, the Board recommended that the financial statements be included in the Form 10-K for the fiscal year ended March 31, 2018. We have also reviewed the various fees that we paid or accrued to MNP LLP during the fiscal years ended March 31, 2018 and 2017 for services they rendered in connection with our annual audits and quarterly reviews, as well as for any other non-audit services they rendered. Audit fees consist of fees billed for professional services rendered for the audit of our financial statements and review of the interim financial statements included in quarterly reports and services that are normally provided by the above auditors in connection with statutory and regulatory fillings or engagements. Audit-related fees consist of fees billed for professional services rendered for the review of SEC filings or other reports containing the audited financial statements. Tax fees consist of fees to prepare the Company’s federal and state income tax returns. Other fees relate to advisory services related research on accounting or other regulatory matters. Our Board is in the process of adopting a policy on pre-approval of audit and permissible non-audit services. The Compensation Committee of our Board is responsible for reviewing and approving the compensation of our executive officers and directors and our general compensation, benefits and perquisites policies and practices, including, without limitation, our incentive-compensation plans and equity-based compensation plans (in circumstances in which equity-based compensation plans are not subject to stockholder approval, such plans shall be subject to Board approval). The Compensation Committee is also responsible for reviewing and approving the goals and objectives relevant to the compensation of our Chief Executive Officer and reviewing and making recommendations to the Board with regard to the compensation of our directors. The Compensation Committee may delegate to our Chief Executive Officer the responsibility for reviewing the compensation of our named executive officers other than the Chief Executive Officer. However, any recommendations by the Chief Executive Officer shall be submitted to, reviewed and approved by, the Board as a whole. The following table sets forth information regarding each element of compensation that was paid or awarded to the named executive officers of the Company for the periods indicated. (1) “2018” represents the fiscal year ended March 31, 2018 and “2017” represents the fiscal year ended March 31, 2017. (2) For assumptions made in such valuation, see Note 10 to the Company’s audited consolidated financial statements included in this prospectus, commencing on page F-19. (3) On September 1, 2017, Mr. Dusseux was hired as our Chief Executive Officer at an annual base salary of CDN $500,000. (4) Mr. Bloch served as the Company’s Chief Executive Officer from April 2013 until September 1, 2017, and acted as a consultant until November 2017. His consulting income and severance in 2018 is reflected under All Other Compensation. (5) On August 8, 2016, Mr. McCarthy was hired as our Chief Commercialization Officer with a base salary of $260,000. Mr. McCarthy left the Company on April 27, 2018. The Company entered into an employment agreement with Dr. Dusseux on September 1, 2017, pursuant to which he serves as our Chief Executive Officer (the “Dusseux Employment Agreement”). Under the Dusseux Employment Agreement, Dr. Dusseux will receive an initial annual base salary of CDN$500,000. In addition, Dr. Dusseux may receive up to 50% of his base salary as a target bonus based on measurable performance goals to be mutually agreed upon once employment starts on a pro-rata basis in the first fiscal year. · 50% in 5 equal separate tranches annually based on Dr. Dusseux’s achievement of annual performance goals to be established by the Board in consultation with Dr. Dusseux. The extent to which each separate tranche becomes vested shall be determined by reference to Dr. Dusseux’s annual performance as measured by reference to the performance targets set for that performance period. In the event a specific tranche is not fully vested, that tranche shall not be forfeited, but shall remain outstanding, and may become vested as a result of Dr. Dusseux’s future performance at an above target level or as a result of accelerated vesting on the occurrence of any other event that triggers accelerated vesting. · Engage Curexo into an exclusive distribution agreement before June 2018. The option, including any portion that is subject to vesting based on the period of Dr. Dusseux’s service and any portion that is subject to vesting on the basis of performance, shall be fully vested on the occurrence of any of the following conditions: (a) A Change of Control (as defined in the Company’s 2014 Equity Incentive Plan) or (b) Termination of Dr. Dusseux’s employment that constitutes a “separation from service” (as the phrase is used for purpose of Section 409A of the Internal Revenue Code of 1986, as amended), other than where such termination is for Cause (as defined in the Company’s 2014 Equity Incentive Plan) or if Dr. Dusseux resigns other than for Good Reason (as defined in the Company’s 2014 Equity Incentive Plan). Dr. Dusseux is also entitled to receive a target annual cash bonus of up to 50% of base salary. Dr. Dusseux is entitled to reimbursement of housing costs of up to $4,000 per month for 24 months and the costs of immigration and annual tax compliance and an annual executive medical provided by Medcan or similar supplier over the time he is employed. In the event that Dr. Dusseux employment is terminated as a result of death, Dr. Dusseux’s estate would be entitled to receive the annual salary and a portion of the annual bonus earned up to the date of death. In addition, all vested options as of the date of death would continue in full force and effect, subject to their terms and conditions of the Equity Incentive Plan. In the event that Dr. Dusseux’s employment is terminated by the Company for cause Dr. Dusseux would be entitled to receive his annual salary, benefits and expenses incurred up to the date of termination. In the event that Dr. Dusseux’s employment is terminated by the Company without cause he would be entitled to receive 12 months’ pay and benefit coverage plus one month for each year of service. Payment of pro-rata bonus for the fiscal year up to the date of termination will also be paid. The agreement contains customary non-competition and non-solicitation provisions pursuant to which Dr. Dusseux agrees not to compete and solicit with the Company. Dr. Dusseux also agreed to customary terms regarding confidentiality and ownership of intellectual property. Bionik Canada entered into an employment agreement with Michal Prywata on July 7, 2014, pursuant to which he serves as our Chief Operating Officer on an indefinite basis, subject to the termination provisions described in the agreement. Pursuant to the terms of the agreement, Mr. Prywata has received an annual base salary of $210,000 since February 26, 2015. The salary is reviewed on an annual basis to determine potential increases based on Mr. Prywata’s performance and that of the Company. On June 29, 2017, the Company changed his title to Chief Technology Officer. Mr. Prywata is also entitled to receive a target annual cash bonus of up to 30% of base salary. Mr. Prywata is further entitled to a cash and option bonus based on a per patent creation basis, as determined by the Board. In the event Mr. Prywata’s employment is terminated as a result of death, Mr. Prywata’s estate would be entitled to receive the annual salary and a portion of the annual bonus earned up to the date of death. In addition, all vested options and warrants as of the date of death would continue in full force and effect, subject to their terms and conditions. In the event Mr. Prywata’s employment is terminated as a result of disability, Mr. Prywata would be entitled to receive the annual salary, benefits, a portion of the annual bonus earned up to the date of disability and expenses incurred up to the date of termination. In the event Mr. Prywata’s employment is terminated by the Company for cause, Mr. Prywata would be entitled to receive his annual salary, benefits and expenses incurred up to the date of termination. In the event Mr. Prywata’s employment is terminated by the Company without cause, he would be entitled to receive 12 months’ pay and full benefits, plus one month for each year of service. Furthermore, Mr. Prywata will have six months after termination to exercise all vested options in accordance with the terms of the 2014 Incentive Plan. All unvested options would immediately forfeit upon such notice of termination. The agreement contains customary non-competition and non-solicitation provisions pursuant to which Mr. Prywata agrees not to compete and solicit with the Company. Mr. Prywata also agreed to customary terms regarding confidentiality and ownership of intellectual property. Bionik Canada entered into an employment agreement with Leslie Markow on September 3, 2014, pursuant to which she serves as our Chief Financial Officer on a part-time, indefinite basis, subject to the termination provisions described in the agreement. On September 16, 2015, Ms. Markow was promoted to full time. Pursuant to the terms of the agreement, as amended, Ms. Markow receives an annual base salary of $210,000 per annum. The salary is reviewed on an annual basis to determine potential increases based on Ms. Markow’s performance and that of the Company. Ms. Markow is also entitled to receive a target annual cash bonus of up to 30% of base salary, and a grant of options in an amount to be determined at the price of the Company’s going public transaction, upon the closing of the Company’s going public transaction, to vest over three years in equal annual installments. In the event Ms. Markow’s employment is terminated as a result of death, Ms. Markow’s estate would be entitled to receive the annual salary and a portion of the annual bonus earned up to the date of death. In addition, all vested options and warrants as of the date of death would continue in full force and effect, subject to the terms and conditions of the plan. In the event Ms. Markow’s employment is terminated as a result of disability, Ms. Markow would be entitled to receive the annual salary, benefits, a portion of the annual bonus earned up to the date of disability and expenses incurred up to the date of termination. In the event Ms. Markow’s employment is terminated by the Company for cause, Ms. Markow would be entitled to receive her annual salary, benefits and expenses incurred up to the date of termination. In the event Ms. Markow’s employment is terminated by us without cause, she would be entitled to receive six months but no more than nine months’ pay and full benefits. Furthermore Ms. Markow will have six months after termination to exercise all vested options in accordance with the terms of the plan. All unvested options would immediately forfeit upon such notice of termination. The agreement contains customary non-competition and non-solicitation provisions pursuant to which Ms. Markow agrees not to compete and solicit with the Company. Ms. Markow also agreed to customary terms regarding confidentiality and ownership of intellectual property. The Company entered into an Employment Agreement with Mr. Maloberti, effective as of June 11, 2018, his first day of employment (the “Maloberti Employment Agreement”). Mr. Maloberti shall be employed by the Company until terminated pursuant to the termination provisions described in the Maloberti Employment Agreement. Pursuant to the terms of the Maloberti Employment Agreement, Mr. Maloberti shall receive an annual base salary of $295,000 per annum. The annual base salary shall be reviewed on an annual basis. Mr. Maloberti may be entitled to receive an annual bonus of up to 40% of annualized actual base salary, based on performance in the previous fiscal year. He is also entitled to participate in the Company’s equity incentive plan, and shall be granted options to purchase an aggregate of 5,000 shares of the Company’s common stock, at an exercise price per share equal to the fair market value of the Company’s common stock on June 11, 2018, the date of grant, and which shall vest equally over a 3 year period commencing one year from the date of grant and in the two subsequent years on the anniversary of the grant date. In the event Mr. Maloberti’s employment is terminated as a result of death, Mr. Maloberti’s estate would be entitled to receive any earned base salary and accrued vacation earned up to the date of death. In the event Mr. Maloberti’s employment is terminated as a result of disability (as defined in the Maloberti Employment Agreement), Mr. Maloberti would be entitled to receive the annual salary, accrued vacation, and benefits through the date of termination. In the event Mr. Maloberti’s employment is terminated by the Company for cause, as defined in the Maloberti Employment Agreement, Mr. Maloberti would be entitled to receive his unpaid base salary earned up to the date of termination. In the event Mr. Maloberti’s employment is terminated by the Company without cause, he would be entitled to receive 6 months’ salary and benefits, plus accrued vacation. Mr. Maloberti may terminate the Maloberti Employment Agreement and his employment at any time, for any reason, provided that he provides the Company with 30 days’ prior written notice. In case of “good reason (as defined in the Maloberti Employment Agreement), the Company shall pay to Mr. Maloberti: (i) 6 months’ salary and benefits; (ii) accrued vacation time if any; provided that the Company shall not be required to pay the 6 months’ salary and benefits in the event the Company elects to enforce the non-competition provisions of the Maloberti Employment Agreement and pays to Mr. Maloberti as a result of such enforcement, no less than that amount in base salary. The Maloberti Employment Agreement contains customary non-competition, non-solicitation and non-disparagement provisions in favor of the Company. Mr. Maloberti also agreed to customary terms regarding confidentiality and ownership of intellectual property. The following table presents the outstanding equity awards held by each of the named executive officers as of the end of the fiscal year ended March 31, 2018, as adjusted to reflect the Company’s one-for-one hundred fifty reverse stock split. (1) On September 1, 2017, we issued 40,718 options to Mr. Dusseux at an exercise price of $24.15, 6,787 options have vested and 50% of the remaining options vest on performance being met and 50% vest annually over 5 years. (2) On January 24, 2018, the Company granted 3,334 options to Mr. Dusseux, 3,334 options to Mr. Prywata, 2,000 options to Ms. Markow and 667 options to Mr. McCarthy at $23.25 that vest equally on January 24, 2019, 2020 and 2021. As Mr. McCarthy left April 27, 2018, his options expired immediately on that date. (3) On July 1, 2014, Bionik Canada issued an aggregate of 13,212 options equally split between Messrs. Bloch and Prywata at an exercise price of $34.50 with a term of 7 years, which vested May 27, 2015. All of such options were issued subject to and contingent on the successful consummation of the Offering and the going public transaction, which took place on February 26, 2015. Accordingly, such options are deemed issued as of February 26, 2015. (4) Pursuant to Mr. Bloch’s Separation Agreement dated September 1, 2017, all of such options vested and expire two years from the date Mr. Bloch left the Company as a consultant or an employee. (5) On December 14, 2015, we issued 6,667 options to Mr. Bloch and 2,667 options to Mr. Prywata at an exercise price of $150.00 that vest equally over three years on the anniversary date starting December 14, 2016. On September 1, 2017, all of Mr. Bloch’s stock options automatically vested pursuant to the terms of his Separation Agreement and expire September 1, 2020. (6) On February 17, 2015, we issued 944 options to Ms. Markow at an exercise price of $34.50, that vested one-third immediately and two-thirds over the next two anniversary dates with an expiry date of seven years. (7) On November 24, 2015, we issued 2,667 options to Ms. Markow at an exercise price of $183.00 that vest equally over three years on the anniversary date starting November 24, 2016. (8) In August 8, 2016, we issued 5,000 options to Mr. McCarthy at an exercise price of $150.00, that vest equally over three years on the anniversary date of August 8, 2016. Mr. McCarthy left the Company in April 2018, 3,334 options have expired as of his resignation date and 1,667 will expire 6 months after his resignation date. (9) On August 3, 2017, the Company issued 10,000 options at $31.50 to Mr. McCarthy, which vest equally over three future years. In addition, he was also granted up to 3,334 additional performance options based on meeting sales targets for the years ending March 31, 2018 and 2019. Mr. McCarthy left the Company in April 2018 and all 13,334 options have expired as of his resignation date. On February 25, 2015, 1,753 post-Acquisition Transaction common shares were issued to two former lenders connected with a $241,185 loan received and repaid in fiscal 2013. As part of the consideration for the initial loan, Mr. Prywata and Mr. Caires, a former executive of the Company, collectively transferred 2,098 common shares to the lenders. For contributing the common shares to the lenders, the Company intends to reimburse them 2,134 common shares; however these shares have not yet been issued. Since our incorporation on January 8, 2010 through March 31, 2018 we did not have any long-term incentive plans that provided compensation intended to serve as incentive for performance. No individual grants or agreements regarding future payouts under non-stock price-based plans have been made to any executive officer or any director or any employee or consultant since our inception through March 31, 2018. We adopted, and a majority of our stockholders approved, the 2014 Equity Incentive Plan (the “2014 Plan”). Under such plan, we may grant equity based incentive awards, including options, restricted stock, and other stock-based awards, to any directors, employees, advisers, and consultants that provide services to us or any of our subsidiaries on terms and conditions that are from time to time determined by us. An aggregate of up to 15% of our common stock and common stock reserved for issuance from the Exchangeable Shares are reserved for issuance under the 2014 Plan, and options for the purchase of 170,675 shares of our common stock have been granted and are outstanding as of March 31, 2018. The purpose of the 2014 Plan is to provide financial incentives for selected directors, employees, advisers, and consultants of the Company and/or its subsidiaries, thereby promoting the long-term growth and financial success of the Company. The table below sets forth information as of March 31, 2018 with respect to compensation plans under which our common stock or Exchangeable Shares are authorized for issuance, as adjusted to reflect the Company’s one-for-one hundred fifty reverse stock split. The following table sets forth a summary of the compensation we paid to our non-employee directors during the fiscal year ended March 31, 2018. (1) Mr. Mathieu resigned from the Board on August 1, 2018. Other than Mr. Auberton-Herve’s annual fee as Chairman of $180,000, our non-employee directors are entitled to receive an annual cash payment of up to $20,000 (until February 2018) and thereafter $50,000 per annum, as well as reimbursement for expenses incurred by them in connection with attending Board meetings. The Company has accrued for these fees but has not paid any amounts other then $210,000 to Mr. Auberton-Herve during the year ended March 31, 2018, part of which related to consulting fees prior to him becoming Chairman. Our directors also are eligible for stock option grants. Mr. Matine and Dr. Thevenon were appointed to the Board subsequent to March 31, 2018. We consider “related party transactions” to be transactions between our Company and (i) a director, officer, director nominee or beneficial owner of greater than five percent of our stock; (ii) the spouse, parents, children, siblings or in-laws of any person named in (i); or (iii) an entity in which one of our directors or officers is also a director or officer or has a material financial interest. Our Board is vested with the responsibility of evaluating and approving any potential related party transaction, unless a special committee consisting solely of independent directors is appointed by the Board. We do not have any formal policies or procedures for related party transactions. · Effective as of December 23, 2016, the Company entered into a Subscription Agreement dated as of December 20, 2016, with existing investors of the Company, including entities controlled by Mr. Gaston-Dreyfus, for the issuance of convertible notes. The Company borrowed an aggregate of $550,000 in this financing from entities controlled by Mr. Dreyfus. Mr. Dreyfus also received warrants as part of this financing. · On March 28, 2016, the Company borrowed an aggregate of $500,000 from entities controlled by Mr. Gaston-Dreyfus. Mr. Gaston-Dreyfus also received warrants as part of this financing. · Between August through December 2017, entities controlled by Mr. Gaston-Dreyfus loaned the company an aggregate of $2,580,000 evidenced by convertible promissory notes. Mr. Dreyfus also received warrants as part of this financing. · On December 19, 2017, an entity controlled by Mr. Gaston-Dreyfus loaned the Company $400,000 evidenced by a promissory note which was paid back January 4, 2018. · From January 2018 through March 31, 2018, the Company borrowed an aggregate of $1,250,000 from an entity controlled by Mr. Gaston-Dreyfus, evidenced by convertible promissory notes. All convertible loans were exchanged for common shares on March 31, 2018 and Mr. Gaston-Dreyfus and his affiliates received an aggregate of 608,028 shares of common stock. As part of such transaction, 61,465 warrants were issued to affiliates of Mr. Gaston-Dreyfus. · From April 2018 through June 25, 2018, the Company borrowed an aggregate of $1,991,673 from an entity controlled by Mr. Gaston-Dreyfus, evidenced by convertible promissory notes. Effective as of July 20, 2018, such convertible notes converted in accordance with their terms into 289,791 shares of common stock. · On January 22, 2019, the Company borrowed an aggregate of $750,000 from an affiliate of Mr. Gaston-Dreyfus evidenced by a convertible promissory note, and such note is convertible into equity of the Company pursuant to the terms of such notes. In December 2015, Mr. Gaston-Dreyfus received 250,000 options for certain consulting services rendered to the Company. Since December 2016, the Company borrowed an aggregate of $700,000 from an entity controlled by Mr. Andre Auberton–Herve, evidenced by convertible promissory notes. All such convertible loans were exchanged for common shares on March 31, 2018 and affiliates of Mr. Auberton–Herve received an aggregate of 98,392 common shares. As part of such transaction, 1,600,640 warrants were issued to affiliates of Mr. Auberton–Herve. In June 2018, the Company borrowed an aggregate of $306,255 from an entity controlled by Mr. Andre Auberton–Herve, evidenced by a convertible promissory note. Effective as of July 20, 2018, such convertible note converted in accordance with its terms into 44,590 shares of common stock. On October 10, 2018, the Company borrowed an aggregate of $300,000 from an affiliate of Mr. Andre Auberton-Herve evidenced by a convertible promissory note, and such note is convertible into equity of the Company pursuant to the terms of such notes. As of September 30, 2018, we had aggregate advances repayable by Mr. Prywata of $18,913. The loan to Mr. Prywata bears interest at a prescribed rate of 1% until March 31, 2018 and 2% thereafter and is repayable on demand in Canadian dollars. At March 31, 2018, there was $208,567 owing to Eric Dusseux, $135,039 owing to Michal Prywata and $116,624 owing to Leslie Markow and $600 to Tim McCarthy for sums paid by them on behalf of Bionik for business expense and bonus payments that were paid subsequent to March 31, 2018. In addition, at March 31, 2018 the Company owed $587,019 as severance to its former CEO Peter Bloch, which is being paid over time ending February 2019. In connection with a CDN$250,000 loan obtained by Bionik Canada (which loan has been repaid), Bionik Canada agreed to transfer pre-transaction 83,574 common shares to the lenders. In addition, Messrs. Caires and Prywata also transferred 100,000 pre-transaction common shares to the loan holder and this will be reimbursed by the issuance of 2,134 exchangeable shares to Messrs. Caires and Prywata. These shares have not yet been issued. Other than the above transactions, there have been no related party transactions, or any other transactions or relationships required to be disclosed pursuant to Item 404 Regulation S-K. The Company is currently not a subsidiary of any company. The following table shows the beneficial ownership of our Common Stock as of February 11, 2019 held by (i) each person known to us to be the beneficial owner of more than five percent (5%) of our Common Stock; (ii) each director; (iii) each executive officer; and (iv) all directors and executive officers as a group, as adjusted to reflect the Company’s one-for-one hundred fifty reverse stock split. Beneficial ownership is determined in accordance with the rules of the SEC, and generally includes voting power and/or investment power with respect to the securities held. Shares of Common Stock subject to options and warrants currently exercisable or which may become exercisable within 60 days of February 11, 2019 are deemed outstanding and beneficially owned by the person holding such options or warrants for purposes of computing the number of shares and percentage beneficially owned by such person, but are not deemed outstanding for purposes of computing the percentage beneficially owned by any other person. Except as indicated in the footnotes to this table, the persons or entities named have sole voting and investment power with respect to all shares of our Common Stock shown as beneficially owned by them. The following table provides for percentage ownership assuming 2,611,538 shares are issued outstanding as of February 11, 2019, consisting of 2,341,460 shares of Common Stock and 270,078 Common Stock equivalents through the Exchangeable Shares. The percentages below also assume the exchange by all of the holders of Exchangeable Shares for an equal number of shares of our Common Stock in accordance with the terms of the Exchangeable Shares. Unless otherwise indicated, the address of each beneficial holder of our Common Stock is our corporate address. · Upon the direction of our Board of Directors, be exchanged for Common Stock on the 10-year anniversary of the first closing of the Company’s 2015 offering, subject to applicable law, unless exchanged earlier upon the occurrence of certain events. The holders of the Exchangeable Shares, through The Special Voting Preferred Stock, will have voting rights and other attributes corresponding to the Common Stock. (2) Includes options to acquire 1,112 shares of Common Stock, (ii) an aggregate of 22,473 Exchangeable Shares held through Lombard International Assurance SA and RGD Investissements and (iii) warrants to purchase an aggregate of 61,465 shares of Common Stock held through Lombard International Assurance SA and RGD Investissements. The address of RGD Investissements is 46 rue Pierre Charron, F-75008 Paris, France. The address of Lombard is 4 Rue Lou Hemmer, L-1748, Luxembourg. (3) Includes 9,321 Exchangeable Shares. Also includes warrants to purchase an aggregate of 11,524 shares of Common Stock. The address of E.C.I. SA is 125 rue Saint Martin, F-75004, Paris, France. (4) Includes 16,312 Exchangeable Shares. Also includes warrants to purchase an aggregate of 10,671 shares of Common Stock. The address of Solomar SA is Le Point du Jour, 44600, Saint Nazaire, France. (5) Includes (i) warrants to purchase 10,671 shares of Common Stock held through Star SCI, (ii) an aggregate of 13,573 options to acquire Common Stock held through 4A Consulting and Engineering, and (iii) 1,667 options to acquire Common Stock held through 4A Consulting and Engineering that are exercisable within 60 days of the date hereof. The address of Star SCI and 4A Consulting and Engineering is 18 Chemin de la Vierge Noire, La Tronche, France 38700. Does not include any shares of common stock underlying outstanding convertible notes held by an affiliate of Mr. Auberton-Herve. (6) Represents options to acquire shares of our Common Stock that are currently exercisable or will be exercisable in the next 60 days. Does not include options to acquire shares of our Common Stock which have not yet vested. (8) Represents options to acquire shares of our Common Stock that are currently exercisable or will be exercisable in the next 60 days. The Dodd-Frank Wall Street Reform and Consumer Protection Act of 2010, or the Dodd-Frank Act, enables our stockholders to vote to approve, on an advisory (non-binding) basis, the compensation of our named executive officers as disclosed in this proxy statement in accordance with the rules of the SEC and commonly referred to as “Say-on-Pay.” The Board has decided that it is a matter of good corporate governance to hold the advisory vote on compensation once every three years until the next advisory vote on frequency occurs. An advisory vote on the frequency of stockholder votes to approve executive compensation is required to be held at least once every six years. Accordingly, unless the Board modifies its policy on the frequency of future votes, we expect to have our next advisory vote on compensation at our 2021 meeting. As described more fully under the heading “Compensation of Directors and Executive Officers” in this proxy statement, our executive compensation programs are designed to attract, motivate and retain our named executive officers who are critical to our success. The programs are designed to align the interest of our named executive officers with our stockholders and to fairly reward them for creating stockholder value and achieving our business objectives. We believe that the various elements of our executive compensation program work together to promote our goal of ensuring that total compensation should be related to our company performance and individual performance. Stockholders are urged to read the section of this proxy statement entitled “Compensation of Directors and Executive Officers”, which discusses and discloses our executive compensation policies, including the Summary Compensation Table which includes tabular and narrative information about the compensation of our named executive officers. This discussion includes information about the compensation of our named executive officers and our executive compensation programs for the years ended March 31, 2018 and 2017. Our Board believes that these programs are effective in implementing our compensation philosophy and in achieving our goals. RESOLVED, that the stockholders of Bionik Laboratories Corp. approve, on an advisory basis, the compensation of its named executive officers, as disclosed in the proxy statement for the annual meeting of stockholders for the fiscal year ended March 31, 2019, pursuant to the compensation disclosure rules of the SEC, including the Summary Compensation Table and any related narrative discussion. The Say-on-Pay vote is advisory, and therefore not binding on our Company or our Board. However, our Board values the opinion of our stockholders and to the extent that there is any significant vote against the compensation of the named executive officers as disclosed in this proxy statement, we will consider our stockholders’ concerns and our Board will evaluate whether any actions are necessary to address those concerns. The affirmative vote of a majority of the voting power of the shares present in person or represented by proxy at the Annual Meeting and entitled to vote is required to approve our executive compensation program. The Board of Directors unanimously recommends a vote FOR the approval of our executive compensation program, as described in the “Compensation of Directors and Executive Officers” section of this proxy statement and proxies received by the Board of Directors will be so voted in the absence of instructions to the contrary. On February 6, 2019, the Board approved the appointment of MNP LLP as the independent registered public accounting firm to conduct our financial audit for the fiscal year ending March 31, 2019, and solicits the ratification of this appointment by the stockholders. Neither MNP LLP, any of its members nor any of its associates, to the best of our knowledge, has any financial interest in our business or affairs, direct or indirect, or any relationship with us other than in connection with its duties as independent accountants. Representatives of MNP LLP are expected to be present at the Annual Meeting, where such representatives will have the opportunity to make a statement if they desire to do so and are expected to be able to respond to appropriate questions. The affirmative vote of a majority of the voting power of the shares present in person or represented by proxy at the Annual Meeting and entitled to vote is required for the ratification of the appointment of the independent registered public accounting firm. The Board of Directors recommends a vote FOR the ratification of appointment of the independent registered public accounting firm as described in this Proposal Number 3. Section 16(a) of the Securities Exchange Act requires the Company’s officers and directors, and persons who beneficially own more than ten (10%) percent of a class of equity securities registered pursuant to Section 12 of the Exchange Act, to file reports of ownership and changes in ownership with the Securities and Exchange Commission and the principal exchange upon which such securities are traded or quoted. Reporting Persons are also required to furnish copies of such reports filed pursuant to Section 16(a) of the Exchange Act with the Company. Based on our review of the copies of such forms received by us, and to the best of our knowledge, all executive officers, directors and greater than 10% stockholders filed the required reports in a timely manner in the fiscal year ended March 31, 2018, except for Mr. Auberton-Herve, who failed to timely file his Form 3, Mr. Dusseux, who failed to timely file a Form 4 showing 1 transaction, Mr. Martin, who failed to timely file his Form 3, and Mr. Malone, who failed to timely file his Form 3. We anticipate that the next annual meeting of stockholders will be held in November, 2019. Any stockholder who desires to submit a proper proposal for inclusion in the proxy materials related to the next annual meeting of stockholders must do so in writing in accordance with our Amended and Restated Bylaws and Rule 14a-8 of the Exchange Act, and it must be received at our principal executive offices no later than July 18, 2019 in order to be considered for inclusion in the proxy statement for the 2019 annual meeting of stockholders. For proposals sought to be included in our proxy statement, the proponent must be a record or beneficial owner entitled to vote on such proposal at the next annual meeting and must continue to own such security entitling such right to vote through the date on which the meeting is held. In order for any proposal that is not submitted for inclusion in next year’s proxy statement (as described in the preceding paragraph) to be presented directly at next year’s annual meeting, we must receive written notice of the proposal in a timely manner. If such notice is received, proxies may be voted at the discretion of management if we advise stockholders in next year’s proxy statement about the nature of the matter and how management intends to vote on such matter. As a reporting company, we are subject to the informational requirements of the Securities Exchange Act of 1934, as amended, and accordingly file annual reports on Form 10-K, quarterly reports on Form 10-Q, current reports on Form 8-K, proxy statements and other information with the SEC. The public may read and copy any materials filed with the SEC at their Public Reference Room at 100 F Street, N.E., Washington, DC 20549. Please call the SEC at (800) SEC-0330 for further information on the Public Reference Room. As an electronic filer, our public filings are maintained on the SEC’s Internet site that contains reports, proxy statements, and other information regarding issuers that file electronically with the SEC. The address of that website is http://www.sec.gov. When multiple stockholders have the same address, the SEC permits companies and intermediaries, such as brokers, to deliver a single copy of certain proxy materials and the Notice of Internet Availability of Proxy Materials (the “Notice”) to them. This process is commonly referred to as “householding.” The Company does not participate in householding, but some brokers may for stockholders who do not take electronic delivery of proxy materials. If your shares are held in a brokerage account and you have received notice from your broker that it will send one copy of the Notice or proxy materials to your address, householding will continue until you are notified otherwise or instruct your broker otherwise. If, at any time, you would prefer to receive a separate copy of the Notice or proxy materials, or if you share an address with another stockholder and receive multiple copies but would prefer to receive a single copy, please notify your broker. The Company promptly will deliver to a stockholder who received one copy of the Notice or proxy materials as a result of householding a separate copy upon the stockholder’s written or oral request directed to Bionik Laboratories Corp., 483 Bay Street, N105, Toronto, Ontario Canada M5G 2C9; Telephone: (416) 640-7887 x108; Email: lmarkow@bioniklabs.com. A copy of our Annual Report to the SEC on Form 10-K for the fiscal year ended March 31, 2018, including financial statements, is being mailed to stockholders together with this proxy statement. No part of such Annual Report shall be regarded as proxy-soliciting material or as a communication by means of which any solicitation is being or is to be made. Additional copies are available to stockholders without charge upon written request to Leslie Markow, Chief Financial Officer, at 483 Bay Street, N105, Toronto, Ontario Canada M5G 2C9. The Board knows of no other business to be presented at the Annual Meeting of stockholders. If other matters properly come before the meeting, the persons named in the accompanying form of proxy intend to vote on such other matters in accordance with their best judgment. (2) To consider and vote on an advisory (non-binding) resolution to approve the compensation of our named executive officers. (4) To transact such other business as may properly come before the Annual Meeting or any adjournment or postponement thereof. At the Annual Meeting you will have voting rights, based on the number of Exchangeable Shares you hold. You are permitted to instruct Computershare Trust Company of Canada, the Trustee under a Voting and Exchange Trust Agreement as to how the Trustee is to vote your Exchangeable Shares at the Annual Meeting. If you do not give voting instructions, the Trustee will not be entitled to exercise the voting rights attached to your Exchangeable Shares. Alternatively, you may instruct the Trustee to give you or a person designated by you a proxy to exercise personally the voting rights attached to your Exchangeable Shares. To instruct the Trustee as to how you wish to exercise your voting rights, you must complete, sign, date and return the enclosed Voting Instruction Form to the Trustee by 5:00 p.m., Eastern time, on March 17, 2019. The Trustee will not be obligated to act on any instructions received after that time. You have the right to revoke any instructions to the Trustee by giving written notice of revocation to the Trustee or by executing and delivering to the Trustee a later-dated Voting Instruction Form. No notice of revocation or later-dated Voting Instruction Form, however, will be effective unless received by the Trustee prior to 5:00 p.m., Eastern time, on March 17, 2019. Whether or not you plan to attend the Annual Meeting, please sign, date and return the Voting Instruction Form in the envelope provided in order to ensure that your Exchangeable Shares will be represented at the Annual Meeting. (ii) in the name of a clearing agency of which the Intermediary is a participant. (ii) a voting instruction form, which must be completed and signed by you in accordance with the directions on the voting instruction form. The purpose of these procedures is to permit you, as a Non-Registered Holder, to direct the voting of the Exchangeable Shares you beneficially own or to attend and vote at the Annual Meeting, in person or by proxy. A Non-Registered Holder generally may revoke a voting instruction form given to an Intermediary by providing written notice to the Intermediary in a reasonable time period prior to the Annual Meeting. Non-Registered Holders should carefully follow the instructions of their Intermediaries and their service companies and contact their Intermediaries promptly if they need assistance. 1. We are sending you the enclosed proxy related materials that relate to the Annual Meeting of Stockholders of Bionik Laboratories Corp. for the fiscal year ended March 31, 2019. You are receiving these materials because you are a holder, or the intermediary identified above is a holder on your behalf, of Exchangeable Shares of Bionik Laboratories Inc., an indirect subsidiary of Bionik Laboratories Corp., and you are entitled to vote the Exchangeable Shares at the meeting. In order to vote, you must instruct Computershare Trust Company of Canada (the “Trustee”) to vote on your behalf by completing this Voting Instruction Form (“VIF”) or attend the meeting in person. 2. We are prohibited from voting these securities on any of the matters to be acted upon at the meeting without your specific voting instructions. In order for these securities to be voted at the meeting, it will be necessary for us to have your specific voting instructions. Please complete and return the information requested in this VIF to provide your voting instruction to us promptly. 3. If you wish to attend the meeting in person or appoint some other person or company, who need not be a shareholder, to attend and act on your behalf at the meeting or any adjournment or postponement thereof, please insert your name(s) or the name of your chosen appointee in the space provided (please see reverse). You may also appoint a designated agent or representative of Bionik Laboratories Corp. to act on your behalf at the meeting. 4. This VIF should be signed by you in the exact manner as your name appears on the VIF. If these voting instructions are given on behalf of a body corporate set out the full legal name of the body corporate, the name and position of the person giving voting instructions on behalf of the body corporate and the address for service of the body corporate. 5. If this VIF is not dated, it will be deemed to bear the date on which it is mailed by the Trustee to you. 6. When properly signed and delivered, securities represented by this VIF will be voted as directed by you; however, if such a direction is not made in respect of any matter, the exchangeable shares you hold, or that are held on your behalf, will not be voted. 7. This VIF confers discretionary authority on the appointee to vote as the appointee sees fit in respect of amendments or variations to matters identified in the Notice of Meeting or other matters as may properly come before the meeting or any adjournment or postponement thereof. 8. Your voting instructions will be recorded on receipt of the VIF and a legal form of proxy will be submitted on your behalf. 9. By providing voting instructions as requested, you are acknowledging that you are the beneficial owner of, and are entitled to instruct use with respect to the voting of, the Exchangeable Shares. 10. If you have any questions regarding the enclosed documents, please contact the representative who services your account. 11. This VIF should be read in conjunction with the accompanying documentation provided by management of Bionik Laboratories Corp.
Voting by internet or telephone are not available, and unless your VIF is received by the Trustee by the time and date stated above, the Exchangeable Shares you hold, or that are held on your behalf, will not be voted. I/We, being holder(s) of exchangeable shares (“Exchangeable Shares”) of Bionik Laboratories Corp. hereby appoint: Computershare Trust Company of Canada (the “Trustee”) OR If you wish to attend in person or appoint someone else to attend on your behalf, print your name or the name of your appointee in this space (see Note #3 on reverse). 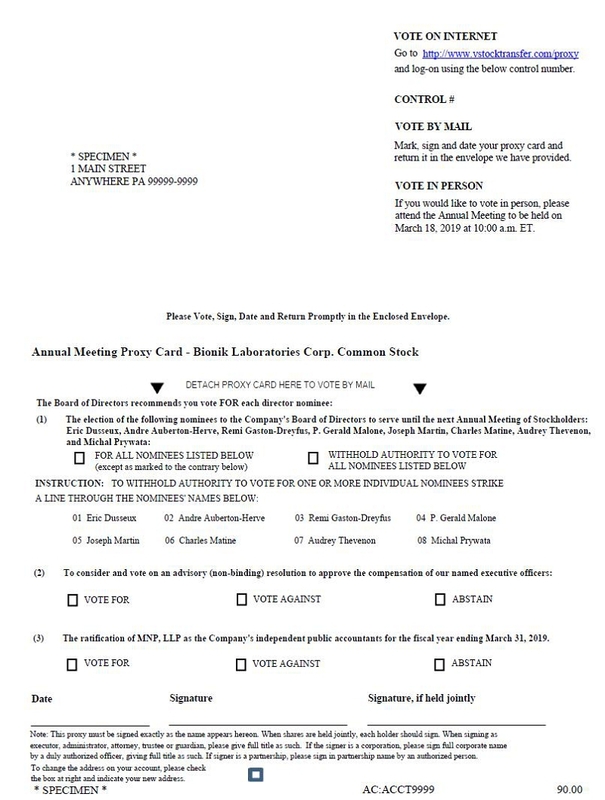 As my/our appointee to attend, act and to vote in accordance with the following direction and on all other matters that may properly come before the Annual Meeting of Stockholders of Bionik Laboratories Corp. to be held at 483 Bay Street, N105, Toronto, Ontario, Canada M5G 2C9 on March 18, 2019 at 10:00 a.m., Eastern Time, and at any adjournment or postponement thereof. Management and directors of Bionik Laboratories Corp. are not currently aware of any other matters to be presented at the meeting. Executed proxies that contain no instructions will be voted FOR each of the individuals nominated to be a director, FOR the resolution approving the compensation of our named executive officers, FOR the ratification of the appointment of MNP LLP as our independent registered public accounting firm for the fiscal year ending March 31, 2019, and in accordance with the judgment of the persons named as proxies in the form of proxy on such other business or matters which may properly come before the annual meeting. Other than the matters set forth in the Notice of Annual Meeting accompanying this proxy statement, we know of no matters to be brought before the Annual Meeting. IMPORTANT NOTE: IF NO DIRECTION IS MADE, FOR, OR AGAINST, OR ABSTAIN, THE HOLDER’S EXCHANGEABLE SHARES WILL NOT BE VOTED. ¨ Please mark your votes as in this example using dark ink only. 1. The election of the following nominees to the Company’s Board of Directors to serve until the 2019 Annual Meeting of Stockholders: Eric Dusseux, Andre Auberton-Herve, Remi Gaston-Dreyfus, P. Gerald Malone, Joseph Martin, Charles Matine, Audrey Thevenon, and Michal Prywata. INSTRUCTION: To withhold authority to vote for any individual nominee(s), mark “WITHHOLD AUTHORITY” and check the box next to each nominee you wish to withhold authority. 2. The approval of an advisory (non-binding) resolution to approve the compensation of named executive officers a non-binding advisory proposal approving a resolution supporting the compensation of named executive officers. 3. The ratification of MNP, LLP as the Company’s independent public accountants for the fiscal year ending March 31, 2019. Authorized Signature(s) – This section must be completed for your instructions to be executed. If you are voting on behalf of a corporation or another individual you may be required to provide documentation evidencing your power to sign this VIF with signing capacity stated. The undersigned, revoking all prior proxies, hereby appoints Eric Dusseux and Leslie Markow, and each of them, with full power of substitution, as proxy to represent and vote all shares of Common Stock, par value $0.001 per share, of Bionik Laboratories Corp. (the “Company”), which the undersigned will be entitled to vote if personally present at the Annual Meeting of the Stockholders of the Company for the fiscal year ended March 31, 2019 to be held on March 18, 2019, at 10:00 a.m., Eastern time, or any adjournment or postponement thereof, at 483 Bay Street, N105, Toronto, Ontario, Canada M5G 2C9, upon matters set forth in the Notice of Annual Meeting and Proxy Statement for the Annual Meeting of Stockholders dated February 11, 2019, a copy of which has been received by the undersigned. Each share of Common Stock is entitled to one vote. The proxies are further authorized to vote, in their discretion, upon such other business as may properly come before the meeting. When properly executed, this proxy will be voted in the manner directed herein by the undersigned stockholder. IF NO DIRECTION IS GIVEN, THIS PROXY WILL BE VOTED “FOR” EACH OF THE INDIVIDUALS NOMINATED TO BE A DIRECTOR, “FOR” PROPOSALS 2 AND 3, AND IN ACCORDANCE WITH THE JUDGEMENT OF THE PERSONS NAMED AS PROXIES IN THE FORM OF PROXY ON SUCH OTHER BUSINESS OR MATTERS WHICH MAY PROPERLY COME BEFORE THE ANNUAL MEETING.